For the UK and Irish market, the number of ocean cruises taken last year reached over two million for the first time, hitting a record 2,009,000 in 2018 – up two per cent from 2017. The UK & Ireland is only the second European market to have reached over two million cruises and the fourth globally. The average cruise passenger age stood at 57 years, which can be contributed to the growth in the number of families choosing cruise as their preferred holiday. 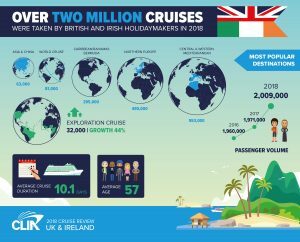 The average cruise duration was 10.1 days, indicating that British and Irish travellers enjoy longer cruises, with the number of 14-day cruises taken last year increasing by five per cent, totalling at 397,000. The popularity of ‘taster cruises’ also grew significantly, with 149,000 passengers taking 1-3 day cruises taken in 2018 – an increase of 29,000 – suggesting that new-to-cruise guests like to ‘try before they buy’ when it comes to a cruise holiday. Cruises in Europe remain the most popular choice for British & Irish holidaymakers, with the Mediterranean, Northern Europe and Baltics taking up almost 70 per cent of total cruises taken, and the market is still dominated by the ‘Big Three’ – the Mediterranean, Northern Europe and the Caribbean. 2018 saw a significant increase in the number of cruises taken in exploration destinations, such as the polar regions, the Galápagos Islands and Antarctica, with bookings growing from 22,000 in 2017 to 32,000 in 2018, an increase of 44 per cent. Cruises in Asia and South America also experienced a healthy growth – the number of cruises taken in South America and Panama Canal grew by 29 percent to 26,000 and in Asia and China the number grew by 41 per cent, from 45,000 in 2017 to 63,000 in 2018. Andy Harmer, CLIA UK & Ireland director, added: “Thanks to the large deployment of incredible ships offering an amazing choice of itineraries in European destinations, as well as the number of cruises sailing ex-UK, our love of cruising Europe still regimes supreme.